I’m casting my mind now back to the time before it was announced that David Yates would be directing Deathly Hallows. There were so many people being bandied about as candidates to direct the film – the most popular suggestions around here were probably Alfonso Cuarón and Guillermo Del Toro. For some reason, I didn’t think any of the directors we’d had – Chris Columbus, Alfonso, Mike Newell, or David Yates – were quite right for the final installment. For a while, I was really in favor of Guillermo Del Toro – and then I thought about Steve Kloves, who has directed films (The Fabulous Baker Boys and Flesh and Bone), and good ones, and has demonstrated his passion for the series; it’s not merely a job to him. I don’t know why I did, but I severely underestimated David Yates and his ability to take on this last book and turn it into really outstanding cinema, because he did it. I’m writing about both parts together not only for the sake of simplicity, not only because Deathly Hallows is far better as one than as two, but because Harry Potter and The Deathly Hallows is one film. I’m always annoyed when anyone complains about Part 1 not coming to a proper conclusion or Part 2 not having a proper introduction. Yes, Part 1 is a film without an end, and Part 2 is a film without a beginning. That’s because they are not two standalone films; that was actually never the point. It’s one film, we just didn’t see it all at once. I was opposed to that choice when I first heard about it, but I was opposed because I assumed that it meant we’d see a film that was far too literal-minded. I wanted to see the filmmakers make some bold choices in their adaptation, because Deathly Hallows is a damn hard book to turn into a film, and does not allow you to translate it; you have to adapt it. It turns out that I was wrong (that’ll be a recurring sentiment in this post). Deathly Hallows the film is not an unimaginative reenactment. While I’m not a cheerleader for the decision to present it in two parts, it wasn’t only a money-grab. What it really served to do was allow them – or allow them to allow themselves – to take all of the moments they needed to let the film to breathe, and to give us a ton of fantastic character moments that there’s no way we would have seen if this weren’t a two-parter. Yates made a bit too much about how tonally and cosmetically different the two parts are and therefore how necessary the two-part presentation was, but it does work. Not only was it elevate the grandeur of this conclusion – I’m going to try to keep my use of the word “epic” to a minimum – but anyone who complains that the pace is uneven in either Part 1 or Part 2 surely has to say that the pace would have been even more unbalanced if they’d seen the whole thing as one. That’s the nature of the beast, but it’s also an advantage to the two-part release. I went to see Part 2 minutes after rewatching Part 1 on July 15th, so that I could have the closest approximation to seeing one right after the other, but I look forward to actually seeing them combined into one film. In so many ways, Deathly Hallows was incredibly demanding on its director. I don’t envy David Yates for the huge pressure that was on him, not just (“just” ) to close the series out in a satisfying way, but with DH being the most difficult book he’s had to adapt. Of course, they’re all hard, but the fact that Deathly Hallows involves this midsection lacking forward momentum, where nothing’s really happening and that’s the point, means that it’s even more challenging than Order of the Phoenix or Half-Blood Prince. That stretch of time – the Camping Trip from Hell, if you will – had to have been the most difficult to nail. You have to be so with the trio as they’re forced to stay out on their own – they can’t stay with anyone they can trust, or they’ll put them in danger, so all they have is to make do with what (very little) knowledge they have in their pursuit for the remaining horcruxes. You have to be so with them in how disconnected they are from the rest of the world – either muggle or wizarding – and how little connection they have to what’s going on around them. They’re out of the loop, in the worst way. They’re not aimless, but they’re rudderless, and the one lead they do have is only serving to eat away at them. I know I’m in the minority here, in that I thought all that worked really well in the book and I think it works really well in the film; I feel all of that, I am with them on this journey, and it’s tense, it’s lonely, it’s miserable, it’s everything it must be. 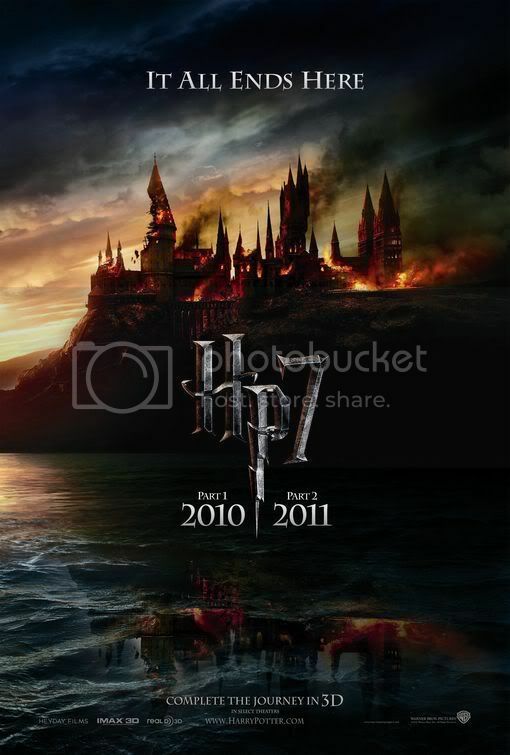 That time was brought to the screen so beautifully; you long for them to be rid of that damn locket, you long for them to make some big progression in their horcrux hunting, you long to see Hogwarts again. And I don’t feel that that portion of the film is slowly or poorly paced, at least not in a negative way – it’s not meant to be quick and dynamic, the film has to take time to breathe there, and it does. It should not rush that. I think it’s paced perfectly, and I wouldn’t lose a frame. Once we leave Shell Cottage, though, Deathly Hallows is all about forward momentum, about a propulsive drive that pretty much carries us straight through to the climax. I was terrified that from this point the film would just blaze by and sacrifice plot coherence or emotional coherence for the sake of action or spectacle. Even after seeing how well Part 1 took its time, I was terrified, because that’s different material. Again, I was wrong. Rather than rushing by and scattering a bunch of half-explained plot points or barely-explored moments, that propulsive energy is absolutely key and it doesn’t get in the way of anything in the area of story/character. The tension is maintained fantastically, too; DH is quite a terrifying film in several places. I’m thinking of the first Malfoy Manor scene (“The Dark Lord Ascending”), Ron’s splinching, obviously Nagini’s attack in Godric’s Hollow, and many more. The two most pivotal themes in the Harry Potter series end up being more crucial to Deathly Hallows than any of the other books/films: the power of love, and the importance of accepting death. I’ve actually gone back and forth over whether I think the film emphasizes either of these as well as it should. Okay, we don’t have Lily’s love protection over Harry passing onto everyone else at Hogwarts and making it so that Voldemort can’t touch them – or do we? Harry doesn’t refer to it, but Neville does talk about how everyone that they’ve lost does still live on, in their hearts, and that carries the same meaning. We do learn, very powerfully, that Snape was in love, until the day he died, with Lily, and, in a moment not in the book, we see him cradling her dead body and crying. That also carries the same meaning and message. Even a passing moment like Neville rushing to tell Luna that he’s “mad for her,” in probably the last chance he’ll have to do so, followed by Harry and Ginny seizing what may be their last chance to embrace, gets at this theme. I’m less certain of how well the theme of accepting death is conveyed here. That’s, of course, the reason The Deathly Hallows are introduced; it’s more than just a way to seal in the defeat of Voldemort, more than just convenient aid for Harry in the end. The Deathly Hallows are symbols of how different Harry and Voldemort are in their attitudes toward death; “master of death” does not mean obtaining immortality, it means that you come to an understanding of…well, of what Dumbledore said in the first book (not movie): “To the well-organized mind, death is but the next great adventure.” Voldemort could never understand that, but when Harry learns that he must sacrifice himself, he doesn’t run from it. It’s the most difficult thing in the world to accept, but he does find a way to accept it, and that’s what makes Harry worthy of those Deathly Hallows. I would have liked this to be discussed a bit in the King’s Cross scene. It is still there, though – you just have to read between the lines a little. And this is not the most terrible thing in the world, to not be beaten over the head with the central messages of a film. David Yates started out (like many great directors, it should be said) in TV, and so he’s often been charged with making movies that feel “like TV.” Not everyone who says this is always complaining, but I have to take issue with this, (A) because I don’t really know what it means, (B) because we are long past the point, if there ever was a point, where TV should be dismissed like that, and (C) because Yates’ films actually feel highly cinematic to me. He’s grown exponentially with each film, and in the case of DH, I have to use “The Prince’s Tale” as an example. That sequence is an utter masterpiece, and it’s not a masterpiece just because it includes everything from the book that it really had to in order to make it work, it’s a masterpiece because it takes all of it and turns it into extraordinary cinema. This sequence really does feel like a stream of memories strung together, as they might actually occur to Snape in his final moments, and all of the clips, visual and aural, from previous movies that are used to round it all out are perfectly incorporated. By the end of the sequence, you’re left in a daze from everything you’ve just learned or had confirmed about Snape, shocked-and-yet-not-that-shocked at the reveal of Harry’s true nature and what that means, and deeply affected by how what you’ve just watched has encompassed so much of the whole series. That’s one example, but again, Yates’ Harry Potter movies are highly cinematic, more and more as they went. His camerawork grows more dynamic, more fluid, more compelling with each film. The man has a great eye, and I’m curious where he’ll go from here. I’m in for whatever that is. Oh, how very, very worried I was about how the final duel between Harry and Voldemort would play out in the film – because in the book, it’s not a duel, and that’s what’s great about it. It’s not a battle of wands, it’s a battle of words. Harry has just realized that he has the upper hand in a big way, and their ultimate showdown on the page is all about him saying to Voldemort, “You’re wrong. You were arrogant, you made huge mistakes, so I’m actually in control right now, and here’s how.” I didn’t expect it to be done verbatim here, I knew they’d have to make it more visual, more dynamic, but I expected a pointless, overblown, dumbed-down fight scene, lacking any of the explanation/resolution that we really needed. Here we go again: I was wrong. That’s not what we have here. They did make it more dynamic, more visually interesting, they opened it up (it probably still would have worked if they kept it in the Great Hall, but still), but you still have Harry taunting Voldemort a bit, telling him – or starting to tell him – that the wand isn’t his and won’t be. And afterward – and this I REALLY didn’t expect – he explains things to Ron and Hermione! We get plot resolution in the denouement! This is no “Priori Incantatem…You saw your parents that night, didn’t you?” This is no confused Marauder’s Map subplot. And it isn’t clunky explanation just for the sake of it, it serves a purpose and it’s satisfying. So well done. David Yates understands tone very well, he’s shown that impeccably on his previous films. Order of the Phoenix and Half-Blood Prince are certainly not perfect. Deathly Hallows is pretty bloody close. I can’t say this as much for Order, but for Half-Blood and Hallows, and Hallows most of all, they feel like the book. Deathly Hallows is the best film in the series for that reason. -We’re introduced to the mirror, a prop that will prove fairly important later, by seeing Harry holding a shard of it in his room, reflecting on Dumbledore’s death and seeing what he fleetingly thinks could be his eye. That’s all well and good, except we’ve never seen this thing before. Okay, so it’s in the book, and it was, in fact, in book five, Order of the Phoenix, but it wasn’t in the film version, and so it’s strange that this should be the first time we see it. I miss the scene in the OotP film where Harry comes across it and then breaks it in his anger that he can’t talk to Sirius at all, and it turns out that they should have included that scene there after all. -Quite the info-dump at the start of the “Seven Potters” scene. We meet Bill Weasley and Mundungus Fletcher, reunite with Ron, Hermione, Mad-Eye, Lupin & Tonks, Kingsley, Hagrid, Arthur, Fred & George, and Fleur, find out that Lupin & Tonks are married, and almost find out that Lupin & Tonks…well, it doesn’t come up yet (surely we’ll find out what their news is later, right?). You hear “Weasley,” see Bill’s red hair, so okay, that’s fine, we get who he is, that’s enough. I would have liked some line referring to/reintroducing Fleur, though – one line, really, because Fleur is such a minor character, and she was a minor character even when she last appeared, in GoF. Lupin & Tonks, as a couple and as separate characters, don’t register, but that problem goes beyond this scene. It’s a little odd to meet a character like Mundungus so swiftly and at this point, but I like that we haven’t necessarily seen everyone involved in this fight, even now. This is a big world, and just because it’s the last movie doesn’t mean you’ve seen all of it. Not even close. -Harry asks back to Muriel, “Dumbledore lived in Godric’s Hollow?” (or something like that). This is the first time in the films we hear the name Godric’s Hollow, so that means nothing. Later, it means something in retrospect, but come on. -Deathly Hallows the book has that subplot of Harry becoming increasing mistrustful of Dumbledore, and questioning not only how much Dumbledore trusted him, but also what darkness really lurks in Dumbledore’s past (Rita Skeeter was actually never more accurate), and that plotline surprised me. It was really compelling, though, and for those readers like me, for whom Dumbledore was their favorite character, it challenged you in that opinion. It made Dumbledore an even more complex, enigmatic, fascinating figure. I never expected this plot to be brought to film in the same way, though, if at all. What’s unfortunate, however, is that, rather than cutting it entirely, that subplot is introduced, by way of Harry having that contentious conversation with Elphias Doge and Aunt Muriel, but then it doesn’t build and it isn’t paid off. We see a copy of The Life and Lies of Albus Dumbledore in Bathilda’s house, Hermione takes it, and when she and Harry are in the forest of Dean, she’s apparently reading it, hands it to Harry, and says the boy (the same boy Harry saw when Voldemort went into Gregorovitch’s mind) is Gellert Grindelwald. Then it’s never brought up again. Well, so what? Who’s Grindelwald and why should I care? The movie doesn’t care, so it shouldn’t have been brought up. Aberforth refers to Dumbledore’s “quest for power,” but that’s a strange thing to hear in and of itself with nothing to back it up. Something like that should either be fully fleshed out or dropped. I like the scene with Aberforth for what it is, but it doesn’t compensate for the way this storyline is handled. We’re not talking about a major shortcoming here – Dumbledore is still left a mystery, and that’s good, that is the point, so they still get that point – but it leaves you wanting. -Spinning off from my last point: I would have really liked to have seen the film touch on Dumbledore’s own youthful obsession with The Deathly Hallows. Now, Harry’s brief fascination with the Hallows and question of “Hallows vs. horcruxes” was not included in the film, and I’m good with that, you don’t need it. If you’re reading this and thinking that Dumbledore’s onetime obsession with the Hallows wouldn’t have worked without having Harry’s, well, theoretical person, I still think it would have, because it would contrast Dumbledore’s need for the control with Harry’s understanding of what the Hallows mean, and serve that theme all the better. -We do have an exterior shot of Grimmauld Place, but I wonder if it registers for someone who has only followed the films that it’s Sirius’ house/Order headquarters from Order of the Phoenix. -Hermione telling Harry/us that she had to alter her parents’ memories would still have made for an effective scene, Emma could still have made that a great moment, but actually seeing it is, of course, great for the movie. What an effective way to open this final film. I’ve heard some criticism that the films don’t adequately illustrate Voldemort’s threat to the muggle world, but with the opening of the Half-Blood Prince film and this, well, that’s all you need. Watching Hermione be forced to remove herself from her parents’ memories and then leave home is heartbreaking, and it says all that needs to be said about how the devastation is affecting even the non-magical population. -I talked about this in my write-up on HBP, but I’ll talk about it again here, because here’s where it proves really advantageous: I love how much Kloves pared back all of the expository set-up regarding the horcruxes in that sixth film. Movie Harry has a lot less information, knows a lot less about Voldemort setting out on his quest than Book Harry did. Yes, that’s the point. This is not a case of things being cut and leaving things scattered and incoherent. We know what we really have to know: a horcrux is an item containing part of one’s soul; one splits their soul through the vile act of murder; one having a horcrux means that they live on even after their body has been destroyed; Voldemort made six, and two have been destroyed, so four to go. Seeing our trio set off on their own on this dangerous and confounding mission is much more powerful when Harry doesn’t have all of this background on Voldemort’s past, his family, and what he would have used for horcruxes and why. Hermione doesn’t even have her handy copy of Tales of the Darkest Art to tell them off the bat that only the most dangerous of substances can kill a horcrux. Dumbledore left him with the bare minimum of information to go on, and, after the three of them try every spell they can think of to wreck the locket, Ron even comments, “Seems strange, mate. Dumbledore sends you off to find all these horcruxes, but doesn’t tell you how to destroy them. Doesn’t that bother you?” Harry doesn’t answer in words, but his expression is his answer. Yes, it does bother him, and a moment like that works better because the set-up was pared back so drastically in the previous film. And although you can make fun of the whole “spidey sense” thing of movie Harry being able to “hear” the horcruxes calling to him, and find them that way, I love that change, I think it makes perfect sense and works really well. Plus, Spider-Man’s awesome. -I love the way we find out that the sword of Gryffindor can destroy horcruxes in the film. There’s no way they could have kept that whole thing with them overhearing Dean, the goblins, Ted Tonks, and Dirk Cresswell talking about the fake sword, and then Hermione pulling out Phineas’ portrait, and then putting the pieces together; that would been so cumbersome and ridiculously protracted. So we have Hermione having a major lightbulb moment and follow her logic from there. Harry’s “…O-kay,” not getting it yet, is funny, and he’s the audience at that point. “This is going somewhere, but what the hell is she talking about?” It’s a lot of info to receive in such a short time, but it actually does end up making sense. And her line, “Actually, I’m highly logical, which allows me to look past extraneous detail, and perceive clearly that which others overlook,” is not only hilarious, but sells this sudden info-dump very nicely. -Another big change from the book that makes perfect sense and works really well for the film is Voldemort feeling it and being affected as each horcrux is destroyed. Yes, the book’s version of things, where he can’t feel it because he’s torn his soul into too many pieces, makes perfect sense as well. I buy them both, but for the purposes of the film, and for giving Ralph Fiennes more to play, this works better. It does not make Voldemort less threatening (Harry even says he feels, if anything, more dangerous). It makes him more vulnerable, more erratic, more…oh, let’s say unbalanced. That’s great; it’s fascinating to see him gradually lose it without completely losing it. -To think that, in the book, Harry doesn’t full-on confront Snape the way he does in the film is kind of shocking, because it’s one of the most satisfying moments in the movie. It’s especially satisfying because, in the movies, the contempt is directed from Snape toward Harry, and Harry actually seems indifferent toward Snape until the end of HBP. Here, though, we get the confrontation we want to see, the challenge from Harry that we need to see, and it’s great. -I love that we bypass the trip to the Ravenclaw common room, because, well, of course Luna would stop Harry and say, ‘You’re not going to find what you’re looking for there.’ Great moment given to Evanna there. -They could have gotten around the Grey Lady scene and had Luna coyly suggest Harry search the Room of Requirement, but it’s a great scene anyway, pretty chilling and captivating. The angle of the Grey Lady having a sort of connection to Luna is one I’m really glad Kloves added, and it shows such an understanding on his part of who Luna is. -In the book, Harry can’t bear to explain to Ron and Hermione that he has to sacrifice himself and then say goodbye to them. That works really well in the book, but in the film, I’m pretty sure I would have felt cheated if we didn’t see them part ways there. It’s another great addition. That’s by no means a list of every positive about this script/these scripts. The few problems I do have with the film are ones of writing mainly, and I don’t think Deathly Hallows is Kloves’ best Harry Potter screenplay – that just might be Half-Blood Prince – but he’s done something great here. We all have those moments, scenes, characters, or plotlines that were upset were cut, but come on, we were damn lucky that these films were so faithful. Kloves proved, from beginning to end, that he really understands, characteristically and thematically, what makes this story so brilliant. None of them are quite perfect in the writing, there are of course flaws, but Kloves always had a very difficult task before him and he handled each film (excepting Order, because he didn’t do that one) beautifully. Yeah, these three are gonna be just fine. This series has done so much right in the areas of directing, writing, and art direction, and most of what I’ve said in those sections of my reviews has been highly positive, but without a doubt, the greatest pleasure in the films was watching Dan, Rupert, and Emma develop these characters and grow as actors over about ten years. They were all good from the beginning in Sorcerer’s Stone – I think so, anyway – but by now, they’re giving such nuanced, subtle, expressive, and full performances. That’s what you want, and that’s what they needed, but you never know with child actors whether they’ll be able to get there when they need to get there. Individually, these three are fantastic – they’re all much, much better than they were in Half-Blood Prince, and they were pretty great in Half-Blood Prince – and I could list ramble on for ages listing the standout moments, small and large, for each, but what that would become is me recapping the entire film. Most of those especially affecting moments, for me, are in the “camping scenes.” It’s all on them at that time, and they carry the day, giving moving, empathetic performances. There’s the proof that these movies aren’t just “oh, take these inexperienced but decent kid actors and surround them with every veteran British thespian and things will turn out okay.” No. Daniel Radcliffe, Rupert Grint, and Emma Watson are real actors, and very good ones. Now, Part 1 is partially about the trio almost being torn apart by the challenges of their mission, but in Deathly Hallows, they function better as a unit than in any of the previous movies – even if it’s always been more about “the trio” than about Harry/Ron or Harry/Hermione or any of them on their own. Radcliffe does some really interesting things, and his performance is never the easy one or the one you might expect. He’s not doing the tortured, disaffected, angsty youth thing anymore, nor is he the full-on superhero. Part 1 is about Harry not knowing what to do with what little Dumbledore left him, and having the doubts of even Ron and Hermione gnawing at him. We don’t need to hear him expound on that, though, all it takes is a look or two on Mr. Radcliffe’s face. In a couple of scenes, he brings this surprising kind of nervy energy, like he’s been cooped up too long and doesn’t know what to do with himself. Then there’s the is-it-too-soon-to-call-it-infamous? dance scene, and Harry and Hermione look like kids there. It’s important not to lose these characters in the plot and turn them into chess pieces, and we’re never allowed to forget these characters’ humanity and multi-dimensionality. Radcliffe’s Harry is far more focused and commanding in Part 2, and when those bigger, more “you cry now!” moments come, they actually weren’t as tearjerking as I expected them to be. I’m not complaining; for instance, after Harry experiences the last of Snape’s memories, and learns that he has to sacrifice himself, it’s a reaction of shock, but the shock soon passes and becomes a kind of mournful understanding. It’s difficult even to describe, so you know it’s a difficult one to play, but Mr. Radcliffe did a great job. Ron, meanwhile, is usually easy to like and sympathize or empathize with, but Deathly Hallows tests you a bit in that. The locket affects him more than it does Harry or Hermione, but it’s not doing all the work when Ron leaves. And his abandonment really hurts, just as it did on the page, it feels like a stinging betrayal for the viewer. That’s Grint’s most memorable scene – it’s the Oscar clip in that alternate universe where he could be nominated for an Oscar for this film – and boy, is he great, but he’s great in the entire thing. Ron goes through such major changes in DH; he gets over his insecurities about his place in his family and about how Hermione feels about him, he recognizes that he does have a place and an identity beyond Harry’s sidekick, he owns up, takes charge, and calls the others when they’re second-guessing themselves (Hermione hesitating to destroy the cup horcrux) or behaving like a martyr (Harry: “I don’t want anyone else to die for me” Ron: “You? This is a whole lot bigger than that, mate. It’s always been bigger than that”). Ron’s much stronger and smarter than…well, than even he realizes, but he grows a lot here. Rupert’s outstanding. He never calls attention to himself, he’s completely natural and relatable. And Emma? Frankly, Emma outdoes them both by so much. Part 2 is balanced perfectly between the three stars, but Emma owns Part 1. What an incredibly touching, real performance, particularly in the opening scene when we see her altering her parents’ memories…and particularly all the rest of the time. I wasn’t surprised that she could pull this off, she’s always been the best of the three to me, but it’s an impressive turn. Seeing the chemistry develop over the years between Rupert and Emma has been a pleasure; they may be like brother and sister, but they project that romantic chemistry that so many pairs in movies that are supposedly romantic comedies don’t. Their relationship isn’t at the forefront, but Ron and Hermione gradually fall in love very believably in these movies. I can’t wait to see where Radcliffe, Grint, and Watson go from here. I will follow their careers as much as I can, and I hope they thrive in film, theatre, whatever they want – but I hope they concentrate in film, because I don’t get out to either Broadway or the West End too often (or ever). Voldemort’s role has been more and more distant since GoF. As a character, not just an idea, he’s been in the background lately. Voldy’s in the second scene of DH, though, and it’s not a high-stakes showdown scene, but a meeting of the Death Eaters. That scene has a great ominous, conspiratorial feel, and it presents us with a Voldemort we haven’t seen before this point. He’s cold, cruel, and in control, but he also shows a sense of humor (“Spoken like a true politician”), and makes a point of shaming and embarrassing Lucius – not only by holding these conference calls in Malfoy Manor, but in taking his wand and then snapping off the tip. Voldemort’s exhibiting more…humanity in this film. Not that he’s all warm and fuzzy or relatable or empathetic, but he’s not the Boogeyman, he’s not mere evil incarnate caricature; just because we’ve seen this guy (?) before doesn’t mean Fiennes, Yates, or Kloves will let him lapse into cartoonishness. Kloves’ choice to have Voldemort feel it as each successive horcrux is destroyed gives Fiennes something to do that he wouldn’t have had otherwise. He becomes progressively more unbalanced as what’s left of him deteriorates. It’s there when he randomly kills a Death Eater – Pius, I think – right after Hermione stabs the cup. It’s there in those oddly comic touches like his giddy laugh after he repeats, “Harry Potter is dead!” for the Death Eaters’ delight, or hugging Draco when he walks over to their side, or that taken-aback hand gesture when Neville announces that he has something to say. I’m such a huge fan of everything Ralph Fiennes brings to this movie. This is probably the first thing anyone needs to know at me: I pretty much worship at the altar of Tim Burton. Calling yourself a Tim Burton fan means you have an affinity for the macabre, it means you have a playfully twisted sense of humor, it means you have a tendency to have a lot more not only fun but also sympathy with the wild, anarchic villain. Playing the odds, then, Bellatrix Lestrange is probably a favorite character for most Tim Burton fans. She certainly is one of mine; that was true on the page, and it’s trueer onscreen, because onscreen, she’s played by Helena Bonham Carter (who is, incidentally, Burton’s main squeeze). She brings such childish glee, such mad, sadistic enthusiasm, to the part, without turning it into a joke. There are two big scenes for Bellatrix this time: her outraged tantrum turned torture session in Malfoy Manor, and the Gringotts break-in with Hermione disguised as Bellatrix. The former is impressively terrifying – not funny – and the latter gives Bonham Carter a chance to do some wonderful light comedy. She did a really great job picking up the way Emma carries herself, and she is convincing as Hermione trying to do Bellatrix. You could fool yourself into thinking it’s Emma in Bella’s makeup and wardrobe, that’s how believable it is to me when I’m watching that scene. Great stuff. Great stuff all the way through, up ‘til Miss Lestrange’s shattering end. Neville Longbottom: Badass. I don’t want an eighth Harry Potter book or movie, but I could see a Harry Potter spin-off. Maybe he just roams around the English countryside kicking *** before he settles down and becomes Herbology teacher. Maybe Luna could tag along and we could see more of those two. I don’t think anyone expected Neville to take charge and show off all that courage the way he did, but it seems perfectly natural in retrospect – especially in the films. I prefer movie Neville to book Neville. I think he’s been better drawn, and the filmmakers have actually given him more moments to shine. Neville’s love and skill for Herbology comes in handy and he suggests Harry use gillyweed in the second task. Neville finds the Room of Requirement. Neville begins his leadership of the D.A. right there on the train when Death Eaters are looking for Harry (“Hey losers, he’s not here”). He gets to blow up a bridge! Everyone involved just seems so fond of this character, and Matthew Lewis – who’s always been good anyway – is totally winning. You have to root for him. He’s kind of the heart of this last movie, or at least Part 2. Oh, how the mighty have fallen. When we met them, the Malfoys were embodiments of snobbish wealth and privilege along with vile bigotry, and while those qualities aren’t gone, in DH the Malfoys are the servants being punished. They’re on the verge of having to actually make a choice. Lucius botched the Ministry mission at the end of OotP, and since then, he spent a year in Azkaban, his son was ordered to kill Dumbledore, Voldemort’s taken over his home, taken and broken his wand, and he’s been generally emasculated and rendered a miserable shell of his former self. Is this Lucius, and Narcissa and Draco, getting payback? No. No, they’re not getting what they deserve, their – or, well, Lucius’ – crimes have been too serious for that. I really enjoy seeing all this happen to them, though, and it’s fun seeing Jason Isaacs give us such a different Lucius: haggard, desperate, totally spineless. It’s interesting that, in the films, we don’t even meet Narcissa until HBP. We don’t meet her until we have to, until the mother is forced to take charge. We don’t know that Narcissa was ever actually a Death Eater, but she was surely an ally and a believer, but when Draco’s life is put in danger, all of that is challenged. When she walks over to Harry’s body in the end of DH, asks about Draco, and then falsely proclaims Harry dead, that is a great movie moment: it’s chilling and it’s exciting and you wonder what could come next. Felton’s meatiest material may be behind him, but Draco’s in a different, curious place here. He’s caught in the middle between the Dark Lord and his family, who’re trying to collectively detach from Voldemort. He doesn’t tell Bellatrix that Harry is Harry. That’s the great chance that he’s always wanted to be rid of Saint Potter, but he doesn’t take it. Why? We never find out. He corners Harry in the Room of Requirement, ready to capture him or worse…but his heart clearly isn’t in it. He pauses and considers when Narcissa pleads him to take his place among the Death Eaters. In the end, this character that was once your classic cartoon bully, just on a grander scale, is another Jo Rowling example that few people are ever as they seem. And ultimately, the Malfoys do make a choice: They choose to run. I admit it, I’ve never seen any of the Leprechaun movies, so this is the creepiest I’ve seen Warwick Davis. But the Leprechaun movies are different, those are horror movies where he’s playing what’s meant to be an icon of fear on the Freddy Krueger level. Griphook isn’t scary, but he’s an unsettling presence. We don’t hear Bill or anyone else warn us about goblins, and we don’t need to, because the way Griphook interacts with Harry, Ron, and Hermione is what counts. I don’t need anyone to expound on the history of wizard-goblin relations, I need Griphook telling Harry he’s an unusual wizard for burying “the elf,” or hesitating to hand the sword off to Hermione before they apparate. Davis doesn’t have a lot of screentime, but he gives a performance that’s detailed and pretty fun. Okay, one sentence for everyone else that ‘s noteworthy: Bill Nighy isn’t terrible, but I was let down by his performance, I feel like he’s too soft or ineffectual and lacks personality. Peter Mullan, even with only a few minutes onscreen, has an authority and a menace that makes Yaxley more memorable than he has any right to be. Rhys Ifans is alright, I buy he and Evanna Lynch as father and daughter without a problem, but in his one big scene at the house, I see him acting, working himself up to a nervous panic. David O’Hara as Runcorn, Steffan Rhodri as Cattermole, and Sophie Thompson (Emma’s sister) all provide comic relief while being believable as Harry, Ron, and Hermione, respectively, in disguise, way over their heads. John Hurt has another fantastic cameo as Ollivander – a really haunted, tortured Ollivander this time. Ciáran Hinds makes a real impression in his little screentime, and definitely sells that he’s the brother of Gambon’s Dumbledore. Her scene didn’t 100% essential, but Kelly Macdonald’s wonderful as Helena Ravenclaw: haunting, fearsome, and wounded. In every one of these music sections, I’ve mentioned the pieces that stick out most to me, from “A Window to the Past” to “Hogwarts Hymn” to “Journey to the Cave.” Deathly Hallows doesn’t have any pieces, at least none that occur to me as I write this, that I feel represent a point in the film but are strong outside of it. Alexandre Desplat’s score does perfectly support and augment every image onscreen, though. I love it. It’s thrilling, it’s moving, and it never goes too far and over scores anything. “Obliviate” (or “The Obliviation” – I’ve seen it under both titles), “Destroying the Locket,” “Farewell to Dobby,” “Statues,” “Severus and Lily,” “Procession,” and “Showdown” are among the most powerful musical moments, because those are among the most powerful moments in the film. Desplat also finds the perfect ways and places to reuse old themes. Beyond the ever-present, ever-rearranged “Hedwig’s Theme,” we hear “Harry’s Wondrous World” when Harry returns to the Room of Requirement (such a stirring, triumphant moment), “Dumbledore’s Farewell” at the end of “The Prince’s Tale” sequence (heart-wrenching), and “Leaving Hogwarts” over the epilogue. Now, every time I’ve read the epilogue I have heard “Leaving Hogwarts” in my head along with it, but, much as I hoped it might be, I didn’t actually expect to return here. So I was truly delighted when I heard it. There was no better note to end on musically. (If that’s a pun, I apologize.) Much as I wanted John Williams back, I am happy with what Desplat contributed. Whenever a new Harry Potter movie would come, I would be a little bit surprised by just how dark the visuals were; “dark” as in bleak, usually. Granted, we’re not talking about Requiem for a Dream or The Road here, but none of these movies felt compromised to me, like they pulled their punches or toned things down to look more family-friendly. Eduardo Serra’s imagery/camerawork is really striking, it stays with you (or, me): rough and lonely during the “camping scenes,” exciting and horrible at the same time during the Hogwarts battle scenes, visceral and captivating everywhere else. The Hogwarts – this whole world, but especially Hogwarts – that Stuart Craig and the rest have created is awe-inspiring, magnificent in its scale and detail. Now let’s blow it up!. The production design has always been one of – if not the – most impressive aspect of the film series, I don’t know what else there is to say. What is new is how genuinely affecting it is to see so much of Hogwarts devastated/destroyed. This castle, which feels as much like home to us viewers and/or readers as it has to the characters, is torn apart in the final act, and amid some terrific spectacle, there’s some emotional impact to that. I figure I’ll have to wash my hands of the Oscars if Stuart Craig doesn’t win. That is, until I cave the next year and watch anyway. -The opening’s great, it is, and a choice was necessary between keeping the Dursleys in with a full scene of their own or doing that montage of each of the trio saying goodbye (or, in Ron’s case, preparing to) their families. They probably made the right choice, but I do still miss the Dursleys’ scene – even if the scene with Dudley that was shot and included on the DVD/Blu-ray is not that good. -The chase portion of “The Seven Potters” just drops dead for me once it becomes a car chase. That would have been so much interesting – and unique – if it had stayed an aerial chase. Forget the whole secrecy thing – I’ll accept that they just don’t care about a relatively trivial matter like that anymore – I just don’t find it compelling. I’ve seen a million car chases, but I haven’t seen a million magical aerial battles. -Great body language on Kreacher when Harry corners him about the locket. -Dobby is actually hilarious in this movie: the “And then…” runner, “Of course. I’m an elf,” “Sir? I like her,” “Who gets his wand?” “Dobby never meant to kill. Dobby only intended to maim, or seriously injure.” Who knew? -That “Magic is Might” statue is…yeah, it’s disturbing. -Love that disorienting first shot of the forest after the trio narrowly escape the Ministry. -I want to like the dancing scene more than I do. I understand why it’s there, it makes sense for Harry’s character for him to reach out like that and try to comfort Hermione a little…but it’s an awkward watch. And I hate that little almost-kiss at the end. -Bathilda’s house is one hell of a set piece. Creepiness abounds. -Ron killing the locket = possibly the best scene in Part 1. It is awesome to behold, it’s hard to watch, but man, it packs a wallop. -The Malfoy Manor scene is one of my big disappointments with the film. For me, the tension just drops out once Harry and Ron are taken to the cellar. Helena and Emma are bringing their A game – Emma’s screams are blood-curdling – but meanwhile, downstairs, Harry and Ron appear no more worried than they were when Snape set the essay the same day as a big quidditch match in third year. I also miss Ron’s pained and painful screams of Hermione’s name, not helping at all but not being able to stop himself either. -I’m assuming that Wormtail’s death was cut not just for time, but because David Yates didn’t know how to visualize it without it looking ridiculous and losing the tension (which, again, I think he did anyway). I get that, because his death is such an odd one, it could look completely silly. It could also look surreal and scary and nightmarish. Missed opportunity there. -I was concerned for years whether Dobby’s death would have any impact in the DH film. He’s been cut from four films in a row, so he hasn’t appeared in a Harry Potter movie since Chamber of Secrets. Surely no one is going to care that he dies, even the people who have been following the movies? I underestimated the power of a small, adorable creature being killed off in a movie, though, because Dobby’s death does make an impact, even with people who don’t know the books. -Voldemort robbing Dumbledore’s grave and taking the Elder Wand was undoubtedly the right place to end the first part. -“He did save our lives twice. And he’s been keeping an eye on us through that mirror all this time. That doesn’t sound like someone who’s given up.” Not sure if that’s it exactly, but what a good line. -Ron being able to get into The Chamber of Secrets by mimicking the sounds Harry made doesn’t work for me, because they took that right out of the book, and it didn’t work for me in the book. In CoS, Parseltongue was not a mere language, it was something you were either born with the ability to speak or not. Jo changed it because she needed Ron to get in to the Chamber. Okay, I get it, it just doesn’t work for me. The scene inside the Chamber is a good one, though. -That was another good change, bringing us inside to show us Hermione destroying the cup with Ron and putting their kiss there. -The sound during Snape's death is particularly unsettling, with that thumping sound each time Nagini strikes and Snape repeatedly hits the wall. -On the one hand, I would have rather we’d seen Fred die. On the other, I’m fine with it as it is, because in the film, where do you put it? It wouldn’t work coming right after the Room of Requirement scene, which is where it was in the book. -I keep forgetting what the exact line is, but I love the new “words are the most inexhaustible form of magic” line. I wonder if it was actually meant as a sort of tribute to Jo Rowling and these books, but that’s partly how it sounds. -Bonnie Wright’s best moment in the series, no doubt, is when Ginny asks Neville who Hagrid is carrying, and then screams “NO!” when it’s confirmed to be Harry. That one hurts. -A lot of fans have had a problem with Harry not using the Elder Wand to fix his own wand, but I love it. I love that he doesn't consider that, and it packs a bigger punch if he simply snaps the Elder wand - the Elder Wand - and tosses it. That says a lot about how little Harry cares about the kind of power the Elder Wand could bring him. -The last pre-epilogue moment, with our trio looking off to their future, standing together holding hands, is just right. -I’ve always enjoyed the epilogue in the book, but it is better in the movie. The first two times I saw it in a theater, there was a smattering of laughter during it, but it works for me. Sentimental, yes, but I want that kind of “happily ever after” sendoff. Wow. To say that this marks the end of my childhood isn’t quite accurate; I got into Harry Potter when I was 12, and stopped feeling like a child a couple years before that anyway. The end of my adolescence, though…yeah, that’s about right. I’ve waxed nostalgic enough in the last couple of months, though. Here is where I say that Deathly Hallows is, easily, (1) the best film in the Harry Potter series, (2) my favorite film of the year so far, and (3) one of my favorite movies, period. It’s in my top 20. (Hyperbole? Damn right it is. It’s also true.) I feel simultaneously empty and full each time I see it. What a thrilling, emotional, satisfying movie and experience this is. Last edited by IenjoyAcidPops; May 14th, 2012 at 2:19 am.